The International Chamber of Commerce (ICC) today introduced the 2013 edition of International Standard Banking Practice (ISBP), the most up-to-date guide for examination of documents under documentary credits. This new edition of ISBP does not amend UCP 600 but moreover demonstrates how its principles and content should be integrated into day-to-day practice. It achieves this by providing readers with detailed practices to be considered and applied when working with different trade documents including invoices, transport documents, insurance documents, and certificates of origin. It also provides coverage of documents which are not specifically mentioned in UCP. 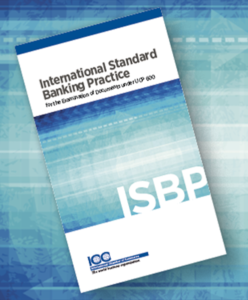 This latest publication is the first complete revision of the ISBP guide, which was first approved and published by the ICC Banking Commission in 2002, following an update in 2007.
presentation of documents to a nominated bank or issuing bank.